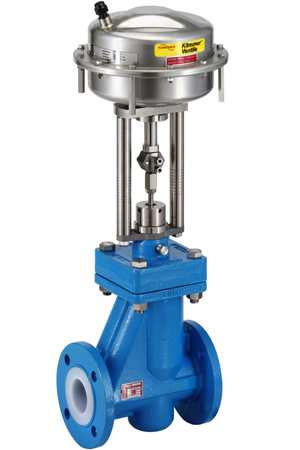 The new Series 132000 control valve completes the range of lined valves within the Flowserve portfolio. High quality lining materials such as PFA (standard) as well as PFA antistatic cover most mediums and applications. The revolutionary PTFE bellows design allows a standard pressure rating of PN16. The increased flow capacity means that the most economical valve can be chosen for the application. The liner material, the seat and the bellows seal are the only parts which are in contact with the medium. High quality lining materials such as PFA, (Perfluoroalkoxy resin) protect the metal parts of the valve assembly. T-grooves provide an extremely positive connection between the liner and the valve metal body, especially important in vacuum applications. Liner thickness is at least 5mm (3,5 mm liner thickness for DN 15 / 1 /2″ and DN 20 / 3 /4″). Liner materials are available in most common combinations. Standard PN 16 bellows seal manufactured from modified PTFE (TFM) for all applications. Extensive bellows life-cycle testing is based on extreme environmental conditions. All tests are performed at a temperature of 120 °C and 16 bar pressure. The optimized body design of the lined valve series 132000 allows Flowserve to offer one of the widest ranges of Kvs / Cv-values for each individual valve size.